'Beherbari Outpost' famed KK and Mohan performing on the occasion of Rongali Bihu celebration at Pune. 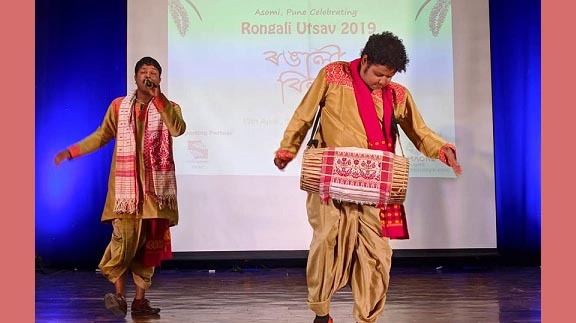 The Assamese people residing at Pune in Maharashtra have witnessed a wonderful Rongali Bihu celebration in the Auditorium of SIMS (Symbiosis Institute of Management Studies) at Pune. The celebration was organised on Saturday by Asomi, the Assamese diaspora of Pune. Vishal Solanki, Maharashtra education commissioner along with Shashidhar Bhave, an NE enthusiast, whose visit to the Northeast and the subsequent publicity inspired more than 400 groups to visit the region, were guests of honour on the occasion, stated a press communique. Rongali Bihu, the harvest festival of Assam, is celebrated with the beginning of the Assamese New Year. The spring season is welcomed with joy and enthusiasm through intoxicating Bihu songs and dances. It derives its name from Sanskrit Vishuvam when day and night are rendered equal through the vernal equinox. It concurs with the Assamese New Year in April and corresponds to the month of Chaitra in the lunar calendar. People welcome the spring season and pray for a bountiful and rich harvest. In Pune, the star-studded celebration started with Bonti Prajwalan and Jatiya Songit. The guests expressed their views and gratitude towards the people of Assam who gathered in the programme. They spoke about the rich culture of Assam and friendship between people of Assam and Maharashtra. On the occasion, the official website of Asomi – www.asomipune.org – was launched by Maharashtra education commissioner Vishal Solanki. The hall was packed with all Assamese people and the programme received overwhelming response from them. The presence of hundreds of people made the occasion more beautiful. Major attraction of the event was invited artistes ‘Beherbari Outpost’ (famous Assamese serial) famed KK (Siddhartha Sharma) and Mohan (Deepjyoti Keot), who entertained the audience with the tunes of their hilarious and comical stunners. Musical attraction of the event was Pratiksha Deka, Sa Re Ga Ma Pa finalist, who mesmerised the audience with her melodious voice. Other events of the evening were Mou Kunwari & Bihu Kunwori competition, Bihu performance, songs, Sattriya dance, skit and audience interaction. Stalls and Assamese selfie booth added a beautiful sensitivity of festival mood at the venue. Chira-doi (jalpan) was an integrated part of the event to welcome the guests. At the end, there was also a cultural component to help people unwind followed by a lavish Assamese ‘bhoj” (dinner) with various delicacies.